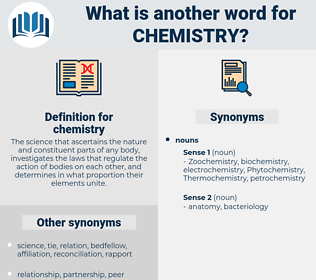 What is another word for chemistry? The science that ascertains the nature and constituent parts of any body, investigates the laws that regulate the action of bodies on each other, and determines in what proportion their elements unite. happiness, calm, calmness, contentedness, ease, peace. Organic chemistry is making such strides that the day may not be far distant when living matter will be made by the chemist, and the secret of its origin revealed. So it is also in the sciences of chemistry and physics.